Raúl Castro (left), with his arm around second-in-command, Ernesto "Che" Guevara, in their Sierra de Cristal Mountain stronghold in Oriente Province Cuba, 1958. Raul Castro (second from left) is shown blindfolding a man to be shot by firing squad. Oriente Province, Cuba, circa 1958. Raul Castro with Salvador Allende, 1959. Raul Castro with Luiz Inácio Lula da Silva, 2008. Cristina Fernández meets Raúl Castro in Cuba during a state visit in January 2009. 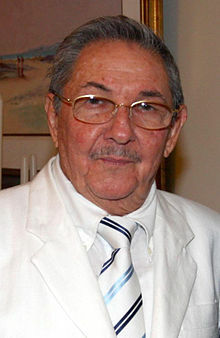 "Regime readies path for Raúl Castro's rise"[স্থায়ীভাবে অকার্যকর সংযোগ] by Frances Robles, Miami Herald, 14 July 2006.